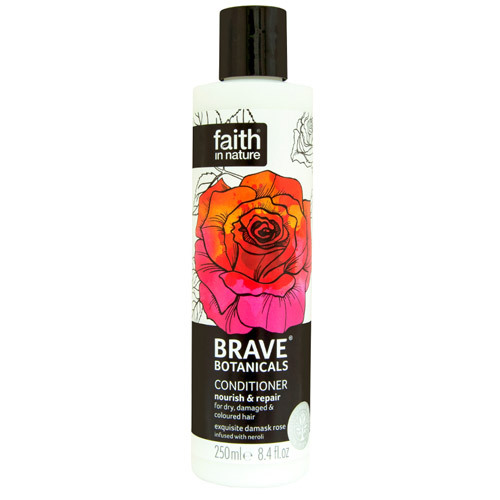 Faith in Nature Brave Botanicals Rose & Neroli Conditioner contains exquisite damask rose and neroli, blended with argan oil, helping to leave hair looking and feeling silky soft. Damask rose, first brought to Europe from Persia in the 13th Century, is wrapped in a wave of sweet neroli - derived from orange blossom flowers, to create a decadent and exquisite aroma. Aqua (Water), Cetearyl alcohol*, Shea butter ethyl esters*, Distearoylethyl dimonium chloride*, Cocos nucifera (coconut) oil**, Rosa centifolia flower extract*, Argania spinosa kernel oil*, Arginine*, Sodium PCA*, Avena strigosa seed extract*, Rosa damascena flower oil*, Panthenol, Citrus aurantium flower oil*, Persea gratissima (avocado) oil*, Lecithin*, Tocopherol*, Glycerin*, PCA*, Glycine*, Serine*, Threonine*, Valine*, Proline*, Helianthus annuus (sunflower) seed oil*, Caprylic/capric triglyceride*, Alanine*, Phenylalanine*, Isoleucine*, Histidine*, Parfum (Fragrance)*, Glyceryl stearate*, Cetrimonium chloride*, Sodium benzoate, Potassium sorbate, Aspartic acid*, Sodium lactate*, Citric acid*, Citronellol°, Geraniol°, Limonene°. Below are reviews of Faith in Nature Rose & Neroli Conditioner - 250ml by bodykind customers. If you have tried this product we'd love to hear what you think so please leave a review. bought this conditioner for my daughter and also the shampoo. She loves it and she loves the fragrance. I am going to treat myself and get it also, I bought the shampoo and look forward to buying the conditioner. Added bonus, it is vegan. Fantastic conditioner for dry hair. I like the smells. Really helps my dry hair. Lovely smell with all natural ingredients and keeps hair healthy and manageable. Smells great, use with the matching shampoo. This product is the best I've ever used, natural with a beautiful smell, leaves your hair feeling lovely and soft, would definitely recommend. Leaves my hair looking and smelling gorgeous. I love it! Love the smell of this product and conditionerr is very good, can comb through hair straight away some conditioners I have to re-apply to get the comb through.